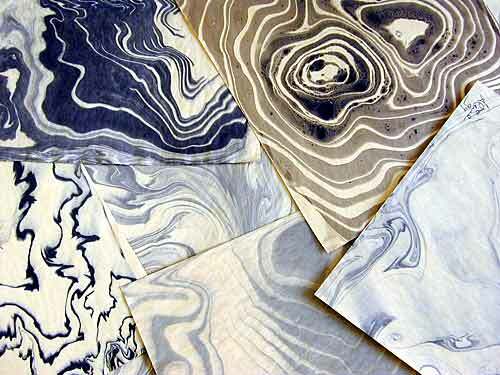 Paper marbling is a method of aqueous surface design, which can produce patterns similar to marble or other stone. 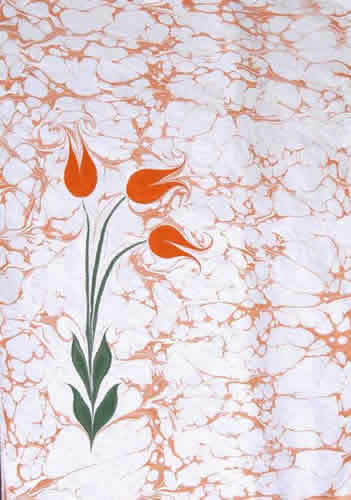 The patterns are the result of color floated on either plain water or a viscous solution known as size, and then carefully transferred to a sheet of paper (or other surfaces such as fabric). 墨流し suminagashi, which means "floating ink" in Japanese is the oldest method of decorative paper made with floating colors that is known today. Author Einen Miura states that the oldest reference to suminagashi papers are in the waka poems of Shigeharu, (825-880 CE), a son of the famed Heian era poet Narihira (Muira 14). Various claims have been made regarding the origins of suminagashi. Some think that it may have originally come from China (Wolfe 6). 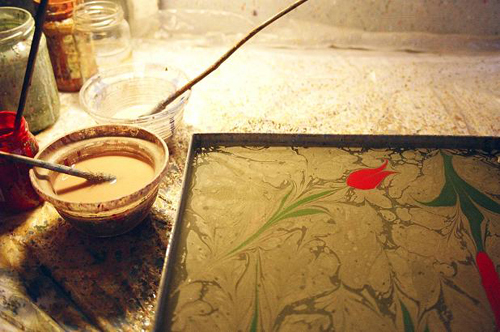 To compare ebru with suminagashi, I think ebru has more layers, and most of the time contain a very recognizable shape, and suminagashi is more freely, and decorative. Ebru is also more colorful than suminagashi. When I learned how to make paper marbling, I never know that I can make layers and control the shape; therefore, ebru really opened my eye. 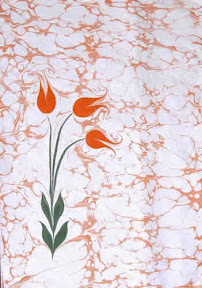 I first taught my students to make paper marbling was not in an art class, but in the calligraphy class. When students try to clean their brushes in the bucket, they were very excited to see the ink flowing on water. I gave them a piece of rice paper, and showed them how to print the ink on the paper. Students also learned, the more students clean their brushes, the darker ink they got on paper. That was a really fun class for me and my students.